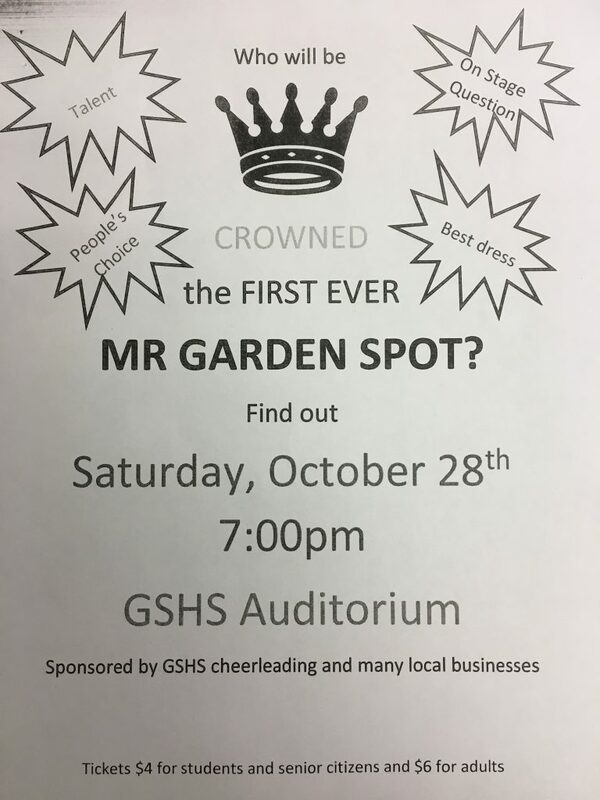 On Saturday evening, October 28th, the Garden Spot Cheerleaders with the support of many local business will be holding the first ever Mr. Garden Spot Competition in the GS Auditorium at 7:00 pm. Fourteen of our high school gentlemen will be placed out of their comfort zone and on stage for talent, evening wear, and on stage question portions of the competition and they need your support. Tickets are being sold at school lunches ($4 students and seniors, $6 adults), at the door the night of the performance, or feel free to email Lindsey Hubert at lindsey_hubert@elanco.org.